First Thai is probably one of the more authentic Thai eateries outside of the seedy Golden Mile Complex. Located at Purvis Street, this casual little restaurant has been serving up food that's earned it a good reputation and queues at mealtimes. 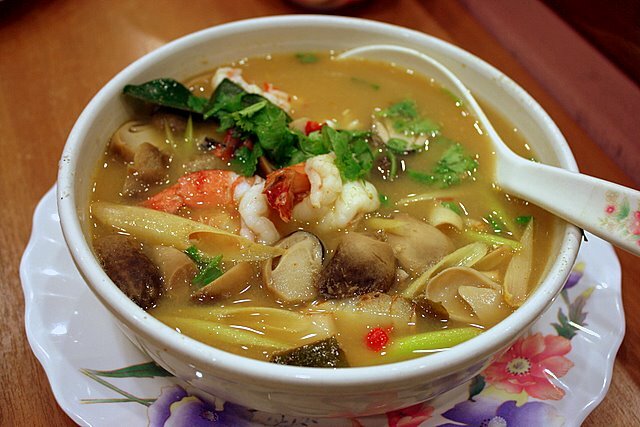 One of its best dishes is the tom yum soup (portion for two or more, S$13 and above, individual serving S$7). It's a deep, murky colour but so delicious. Chockful of fresh prawns, lemongrass, galangal, chili padi and cilantro, this is a potent brew. And oh, loads of straw mushrooms, which I absolutely love with tom yum! 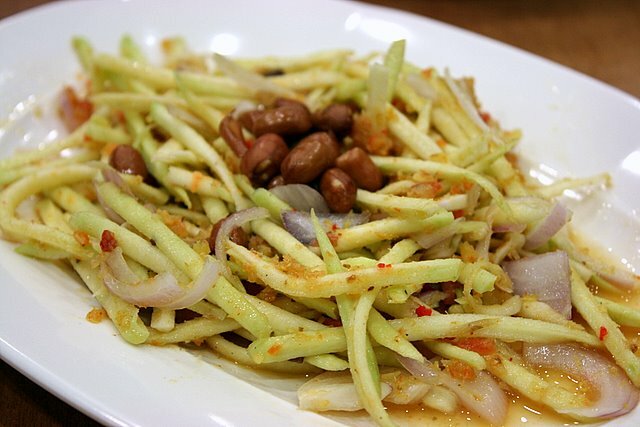 The mango salad (S$8) is a paltry portion, but don't let its unimpressive presentation fool you. Every bite is an intense explosion of flavour - tart, umami, savoury, sweet...you can tell they use really good ingredients, especially the dried shrimp. This is one of their six new dishes. 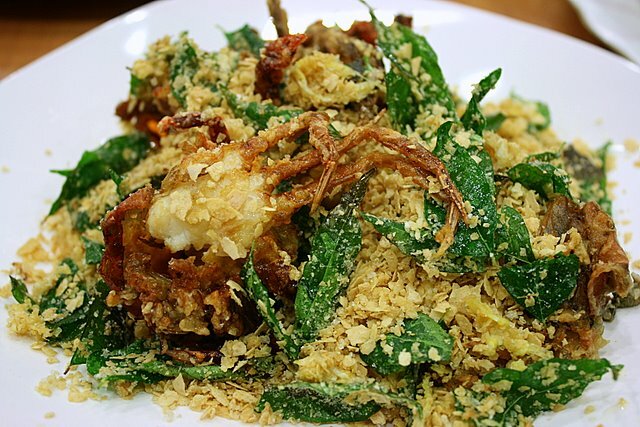 Cereal soft shell crabs (S$15) marry two of my favourite items in one dish. The cereal bits are sweetly crunchy, dry and not greasy. They are generous with the curry leaves which is nice but I thought they could have added some chili padi for a spicier kick. Possibly the only disappointment of the day. 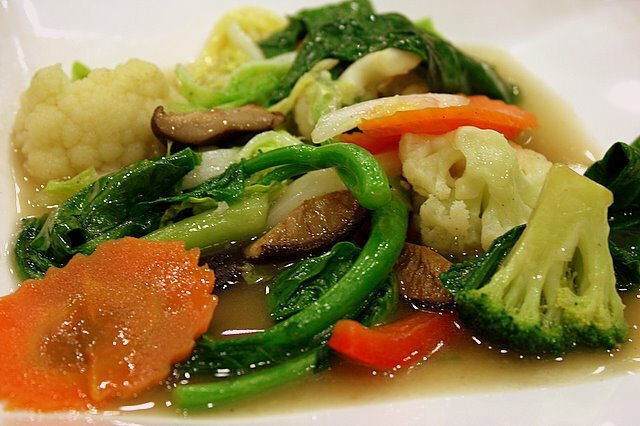 Very small portion of "fried mixed vegetables" (S$6) which were a bit bland. Should have gone with kailan or some other variant. 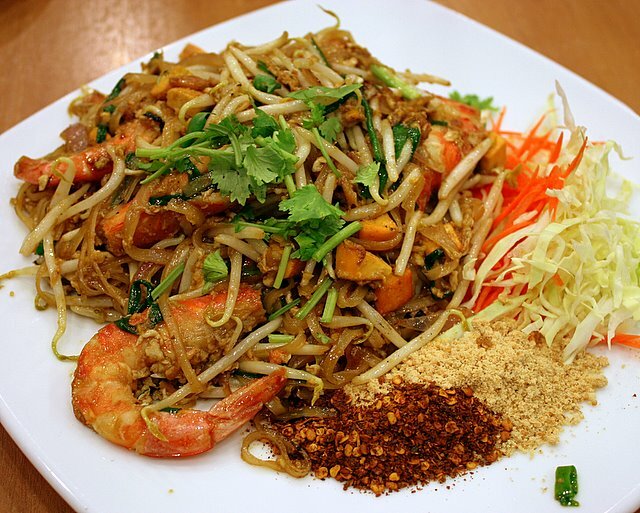 Ah pad thai, the quintessential Thai noodle dish. I confess to liking it a bit more than I should. Ought to really go beyond this choice of carb. Hubby says their olive rice's not nice though. The pad thai (S$10) here is not bad. Not so salty that you can't use it as a base for other dishes. But the prawns for some reason did not taste as fresh as the ones used in the tom yum soup. Service is quick and efficient, and food comes fairly quickly, even when the place is fairly crowded. The place is decorated with whimsical flowers and art pieces but not air-conditioned. Fans provide the only air-cooling respite you'll need from the hot and spicy dishes. Oh the coconut juice is refreshing too. Prices can add up especially if you're having seafood, but there's no service charge or GST to inflate your final bill. See if they have a broad rice noodle dish called Pad Kee Mao.. I actually prefer it over Pad Thai.. it's spicier and less sweet. Kenny: beautiful, isn't it? I like it too. Food not quite as pretty or exotic, but enough to delight the senses. D: hmm, didn't see that on the menu but I will remember look out for this elsewhere. They have Pad See-ou, horfun, tanghoon and crispy noodles which are too similar to Chinese style noodles, IMHO. 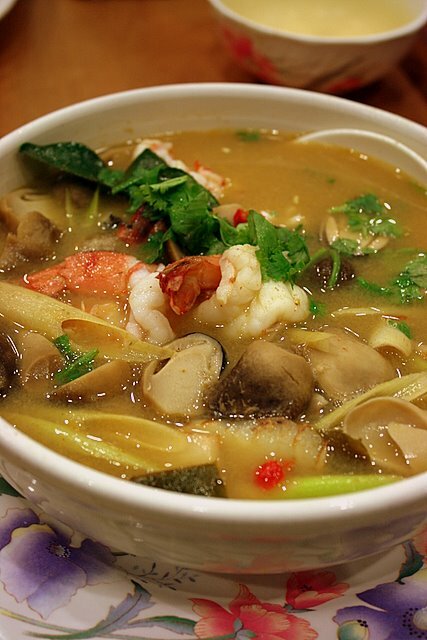 The tom yum soup certainly looks deep in flavour :) Do they have the clear, deceivingly spicy version? 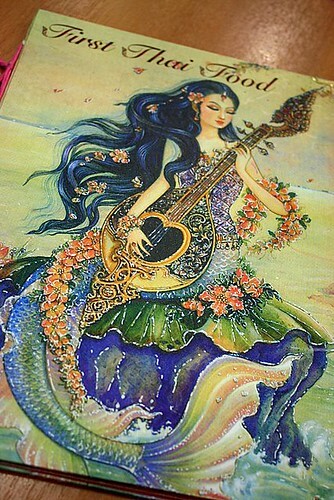 Oh I absolutely love First Thai! And I must try the crab when I go next. Momo, I love that innocently clear but bitingly spicy version! But haven't seen that type yet at First Thai. Next time I must ask them. Esther: mmmh crab. Wonder if they do it well there. Don't often see it on the tables. I want the soup pleaseeeeeeeeeeeeeeeee. i was a tad disappointed when i realised i've ordered wrongly but the seafood horfun turned out to be alrite too. but the crab stick served with the horfun tasted funny.. a weird taste i can't put my finger too.. tastes a tad unfresh tho they are frozen food. but it's defnitely value for money considering there's no service charge and gst. reception was warm and setting was cosy. 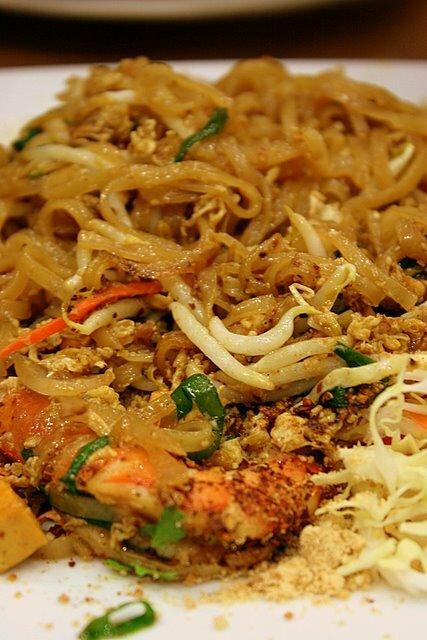 will definitely return for a second time so i can sink my teeth into the PHAD THAI!! !